We recently bought a vacation home at the Resort at Palmetto Bay on the beautiful island of Roatan. Roatan is renowned for its scuba diving and snorkeling as the Meso American reef is just steps off shore. 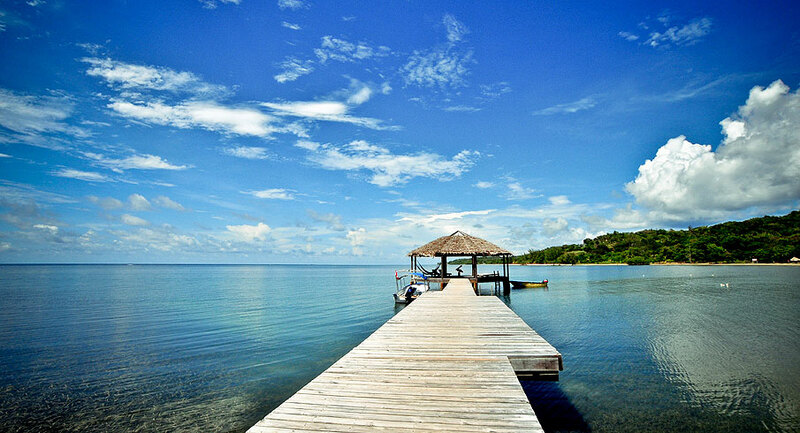 Roatan is also easy to get to with direct flights from the United States and certain cities in Europe. It is largely still undeveloped and undiscovered but with now sometimes up to 4 cruise ships a day coming into port, that will soon change. We thought it was the perfect time to invest in a warm weather property. We already own a vacation condo in a ski resort but we are sick of the cold and my husband doesn't ski. 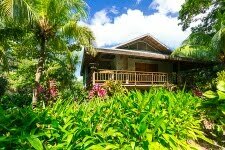 So in April 2015, while on vacation in Roatan, we bought a beautiful, Bali inspired home with 3 bedrooms and 2 bathrooms on over 1/2 acre of tropical gardens just steps from the beach. Having been built in 2008, it was in pretty good shape but could use some simple updating. But we all know how that goes, one thing leads to another, and before you know it, you have spent a ton of money and are working on a complete makeover. If the money being spent and the stress of a renovation isn't enough, add to it that I am trying to do this long distance, and well, you can imagine many sleepless nights worrying. All I can say so far in this process is, thank goodness for my wonderful management team of Heather and Clay at roatanvacationhomes.com and the wonderful people at the freight forwarder, Dip Shipping. Without them, none of this would be possible and I can guarantee you I would end up with more gray hair than I already have. Since I had no idea what a freight forwarded is and if I even needed one, I decided to dedicate Roatan Renovation, long distance part 1 to the issue and hopefully help those that also decide to do a renovation long distance. I assumed, incorrectly of course, that whatever I couldn't find on the island for our home, I could just ship it via UPS or FedEx from the states to our home on Roatan. Wrong. First, I found out that there are no street names or addresses on the island. OK, so first issue, how to I address a box without an address? Then I find out that the mail service is totally unreliable on Roatan. Unless you stop by the post office and ask if you have any packages, the package could just sit there for months. If someone that works there knows you, they might pick up the phone and let you know you have a package. Not the best and safest way to send expensive fixtures and the like to Roatan. Hence, enter a freight forwarder. Based on the recommendation of my management team, again, another reason to have a good one, I contacted Dip Shipping who are headquartered in Florida but have other shipping ports for those not living on the east coast of the US. The owner, Maria, walked me through the whole process. I send any packages to myself at their address in Florida. They will then measure and weigh it, add insurance for you if you want, and then invoice it to you and you pay them. I gave them my credit card number which was easier for me as in total I sent 12 boxes and 4 appliances through them. They put the box in a sealed container, which goes on a ship with other containers going to Roatan and it gets there in about 5 days. When the container arrives in Honduras, it takes another few days to go through customs, which Dip handles and then Dip Shipping delivers right to your front door, or in my case, across the street to my management company's front door. How convenient is that? Besides the boxes, I sent a 48 inch TV, a full size range and a full size washer and dryer. Everything arrived in perfect condition. Just a few issues to be aware of here in the US. You are responsible for getting everything to Florida on your dime. Thus, when I ordered the appliances, I went through a big box store that had free delivery. They delivered everything to Florida for me and I had to just pay for the shipping to Roatan. However, I ran into a snag when I tried to order the TV through Best Buy who also offers free shipping. The order would not go through and when I called Best Buy, I was told they would not ship to a freight forwarder because of potential scams. Seriously? I ending up going into my local Best Buy and the helpful customer service person was able to some how do it and I got the TV to Florida on Best Buy's dime. Last but not least, I learned this last lesson the hard way. When buying a lot of smaller items, pack them yourself and ship them via UPS or FedEx, whatever you prefer, regardless of whether the store you are shopping at offers free shipping. I was buying a lot of items such as towels and sheets from Bed Bath and Beyond that also offered free shipping. The problem is, they would ship just 1 or 2 items in a box as they became available and Dip Shipping charges for every box, regardless of weight. So what I could have packed into 1 or 2 boxes ended up being 7 or 8 boxes that I had to pay for. It would have been cheaper to pack them myself. Oh well, live and learn and all the rest of the next items I sent, were packed by me and I paid the shipping to Florida. Much cheaper in the long run to pay the UPS shipping for 1 or 2 boxes and then paying Dip Shipping for 8 or 9 boxes. I hope this helps you understand the process better. Next up, the ongoing renovation, long distance part 2. Stay tuned. In the meantime, if you want to rent this tropical oasis, please contact us.